Slices of Life 004: I Give You These 12… um… 8 Apostles! 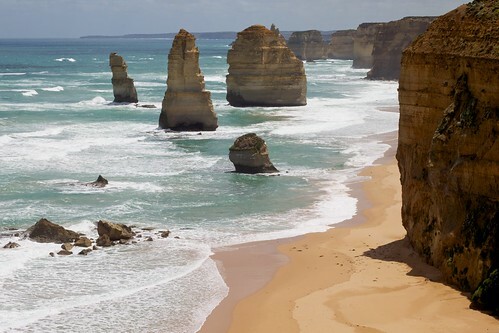 This SLices of Life comes to from the beach, in view of one of the key places I wanted to see in person, the Twelve Apostles along the Great Ocean Road in Victoria. Just like Mel Brooks and his Fifteen… Ten Commandments satire, sometimes you lose a few in the wash. There was another 10+ minute section for this slice, but once again, the levels on the Android Voice Recorder app went bonkers and the levels are way high. I think I found the right menu option to prevent this– the one that says “Your new iPhone 4S will be delivered before you get home from Australia”. And it should at least provide some impetus on reflecting on life vs kvetching about my damned phone. I had left melbourne the day before, where my friend and former Maricopa Colleague, Jan, picked me up at the Hilton. Jan had moved here in the 1990s and has undergone the full transformation to become a real Aussie (she lives here). 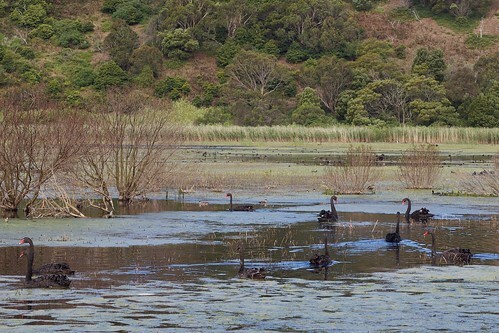 We took the inland route through some lovely country side, and got to see some views from volcanic crater rims, even seeing the real black swans. 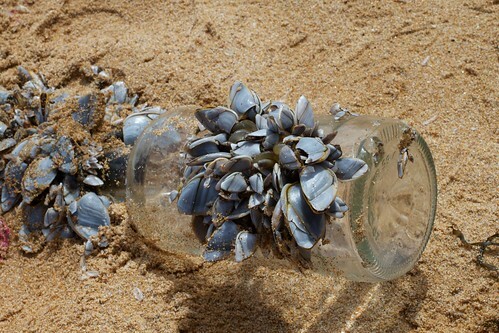 But it was the beach that called– I am a desert dweller, and I do like my mountains, but I also love the beach. It’s where I spent all my summers as a kid, and the sound of the ocean brings me peace. With my work done on this trip that paid for the way over, I can be coasting now, sitting back, but am I also trying to Always Be Reflecting. My reflecting was distracted by seeing Steven Seagull who wandered over to join slice of life (it made my think of Scottlo’s slice episode describing the muscular dude in black with the black hand bag. 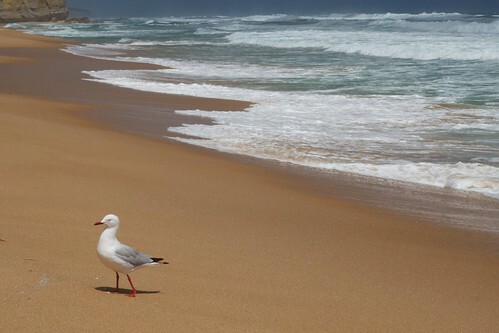 I have another two weeks of holiday travel here in Australia, it is in a way another leg of my road odyssey, which technically ended when I drove Red Dog into my driveway on November 19, but I am including this trip just the same. 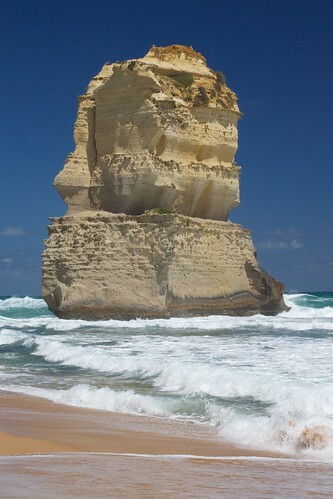 So there are apparently no longer Twelve Apostles, maybe only 8, they seem kind of hard to come by or fragile. Not what you really expect for Apostles. I once saw a production of ‘The Tempest’, near ‘The Apostles’ in a number of beach side locations, including a cave. It was quite brilliant evening weather too and the players enjoyed the freedom of the Great Outdoors to ‘do Shakespeare’.